If you are interested in applying for a job with the Hand Crafted, find the lead (listed below - if no lead is listed, contact an admin) and roleplay with them! That is the best way that they will know if you will be a good fit for their business! 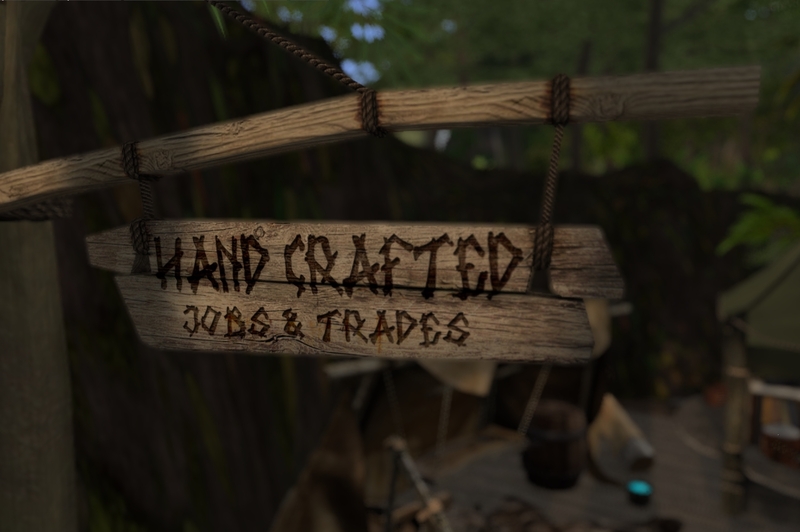 Hand Crafted Jobs and Trades is an open air market located on the Craft dock in Stormstead Village. Hand Crafted is also a neutral organization - it does not cater or differentiate between races or Factions. Any may work or perform business here. The dock hosts many small tents and awnings where crafters can ply their trade, barter for goods, and accept crafting orders. There is a strong sense of pride, and resilience with those who become members of Hand Crafted. This group of individuals is a resourceful group, working hard to provide items and services for those that need them. Hand Forged is a simple basic forge is available for smithy orders for a wide variety of purposes. It is limited due to it’s small nature and available resources but can craft anything that a simple forge can do. Axes, spear heads, armor, etc. It is limited in that it cannot craft magical weapons and artifacts. It also cannot be used to craft ‘magical’ metals such as mithril or adamantine. It can be used by any of the crafter employees with blacksmithing skills. Respond to the Crafter Corner pager (even if it is to IM customer letting them know you cannot make it). Have a Mysts of Eyr forum account. Have Access to the Artisan Directory to determine if we have an artisan who can meet the customer’s need. Complete Order forms in the forum and assign it to the Correct Artisan for completion. Negotiate the best barter/trade deal as they can to benefit the Artisans and the Shop. Deliver completed items to the Crafter Dock for pickup and Mark the Orders as Complete. Update the Crafter Log with important notes and information about happenings in the Shop. Interested in becoming a Crafter? All artisans who wish to promote and sell their crafts or use the Hand Forge facilities must complete an application and agree to the terms. Contact the business lead (listed above or an admin if no admin is listed) and roleplay with them!